Admirers of le mâitre have enjoyed a plethora of boxes of live material over the last few years. It seems superfluous to add that this is another. Eight well-filled discs may, on cursory inspection, bring forth a downward twitch of the mouth, a taut pursing, as if to say; yet more Monteux Stravinsky, Tchaikovsky, Debussy, yet another Enigma Variations, still more Wagnerian chunks. But take a more measured look and you’ll see things wholly new to the discography of the conductor, things that broaden his stylistic parameters on disc – things such as, and these are major additions as even the most miserly of readers must agree, the Bartók and Szymanowski concertos. All the works here were recorded during the years 1951-58. All were recorded during concerts given at Symphony Hall. Monteux and the Bostonians ride on home turf during roughly twelve hours of superior music-making, mostly in fine sound. The concerts are not replicated in their entirety, nor are they presented ‘as is’, or ‘was’, but are interspersed throughout the boxes. The same concert that gave us the Mendelssohn Hebrides, for instance, also had on the same bill The Rite of Spring, and Tchaikovsky’s Fifth Symphony. This shuffling about has no deleterious effects. The Hebrides is strong and tangy by the way. Its disc-mates include a strong willed Haydn Symphony No.94 with a delightfully pomposo Andante and an exciting finale – the whole performance not dissimilar to the commercial recording he made with the Vienna Philharmonic. And there’s also Schubert’s Ninth from the same concert that gave us Creston 2. And yes, I’m thinking what you’re thinking. What did that sound like and when will we get to hear it, to join his live 1956 NYPSO inscription? In any case, and rather amazingly, Monteux didn’t leave behind a studio inscription of the Ninth. He doesn’t take the repeats but does lead a most persuasively controlled and fluid Andante properly stressing its con moto elements. Disc two opens with Schumann’s Rhenish. It again is strong, even in places beefy, but exudes a refined, pragmatic expressivity in the slow movement, and an increasingly noble tread. Monteux was frequently a fiery though not unrestrained proponent of Tchaikovsky and this Fifth is no exception. The brass cut through with drama-laced calls and there’s a warmly emollient slow movement, a powerful, improvisatory-feigning finale. His Elgar is marvellously flowing and moving, though not quite as interpretatively cogent as the studio recording. Textually you’ll want to note the added percussion reinforcements in the finale. The rest of disc three is given over to Stravinsky, a composer with whose music he was closely associated, of course, but which was also to become increasingly problematic for him. The Rite of Spring is not given a panoramic, colouristic profile but it still bites deeply. He directs the Petrouchka Suite from a concert given two years earlier, but in the last disc, from a concert given in stereo in January 1958, we get the whole thing. The restorative work in the latter case, by Aaron Z Snyder, is first class. We move in exclusively Russian waters for the fourth disc. There is nervous tension a-plenty in Hamlet. ‘Mozartiana’ – or the Theme and Variations fourth movement from the Suite No. 4 in G major to be precise - is attractively shaped, though there’s a 16 bar cut. The mélange that is the Concert Fantasy is bravely and excellently dispatched by Vera Franceschi. There’s a small cut – judicious or unnecessary according to one’s view. Franceschi was a fine, dextrous musician. She died of cancer at only forty. Once again we’re fortunate in repertoire selection in the case of a sprucely delivered Prokofiev’s Classical Symphony; there are no studio recordings. Again this is a stereo Snyder restoration. I should add that the rest of the set’s restorations are by the excellent Maggie Payne and equally good. 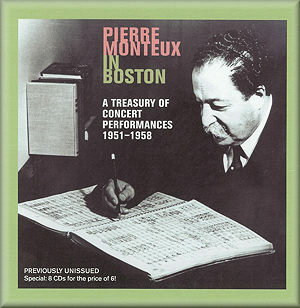 More Tchaikovsky occupies the fifth disc in the shape of a performance of the Pathétique given just a week before the famed studio recording with the Boston for RCA. The differences are in essence few but this powerful inscription culminates in a visceral and dramatic finale that is, if anything, even more convincing than the commercial reading. He also recorded d’Indy’s Istar but this richly characterised version will do very nicely, not least when Monteux officiates between the lissom winds and the pungent brass. Two elite fiddle players dominate the next disc. Tossy Spivakovsky plays Bartók’s Second Concerto and Roman Totenberg plays Szymanowski’s First. It’s highly fortunate to hear the Bartók for two specific reasons; firstly Monteux didn’t record it, and secondly Spivakovsky gave its American premiere. He plays with lyrical bite and a deal of panache and Monteux brings out an impressive quotient of romanticist affiliations in the orchestral fabric. I happen to prefer Spivakovsky to Menuhin or Rostal in this work. Totenberg, far too neglected these days, gives a splendidly aristocratic account of the Szymanowski, another work the conductor didn’t record commercially. Totenberg is still alive at the time of writing (February 2010) having reached the age of ninety-nine. This serves as a small salute to a master musician. Monteux made one recording as a violist, as far as I’m aware, back in 1903. As an esteemed chamber player his sensitivity toward string colleagues is evident. So is his love of Wagner. There are a few examples here – a powerful Parsifal Prelude and the expected, but no less welcome, extracts from Götterdämmerung. The Debussy examples are something of a torso but raptly played for all that. And we end finally with two of his greatest strengths; another example of how a live performance can ratchet the tension still further; the Tchaikovsky Fourth. The Andantino in particular generates real heat with poised rubati, and then comes a vivaciously fast scherzo. To end we have Stravinsky’s Petrushka (complete, not the suite). I hope we never reach the stage when people begin to tire of live, previously unreleased Monteux performances. In this handy box there are insights to last a lifetime of musical listening. They are authoritative, finely played, well recorded and transferred, with perceptive notes.